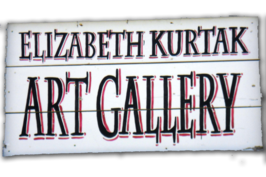 Elizabeth is a lifelong Grand County local and formally trained fine artist specializing in watercolor. She is nationally acclaimed having displayed work in galleries in New York, Las Vegas, and California. Described as lithe, free, and vibrant, relating organic forms with geometric and industrial shapes is a unifying theme in much of her art. Subject matter includes local landscape, flora, fauna, women, turtles, birds, and anything else the artist considers "pleasant". 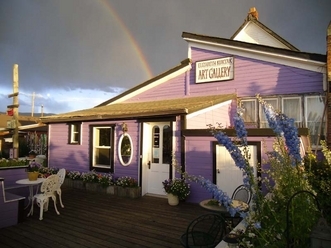 The gallery, est. in 1998, is inside the historic Fraser Mercantile Building, through the garden gate. Located only 2 miles from Winter Park and right across the street from AMTRAK in the heart of Fraser, the beautiful art, gardens, and historic vibe are well worth inclusion on your vacation itinerary when visiting the area. The artist is on site, usually gardening or working on a piece. She enjoys meeting her customers face-to-face in her gallery. "It's nice to know where my paintings are going and to have the opportunity to meet the people that love them enough to take them home..."
Prices range from $20 prints, to framed originals starting under $100, to giant originals around $3000.